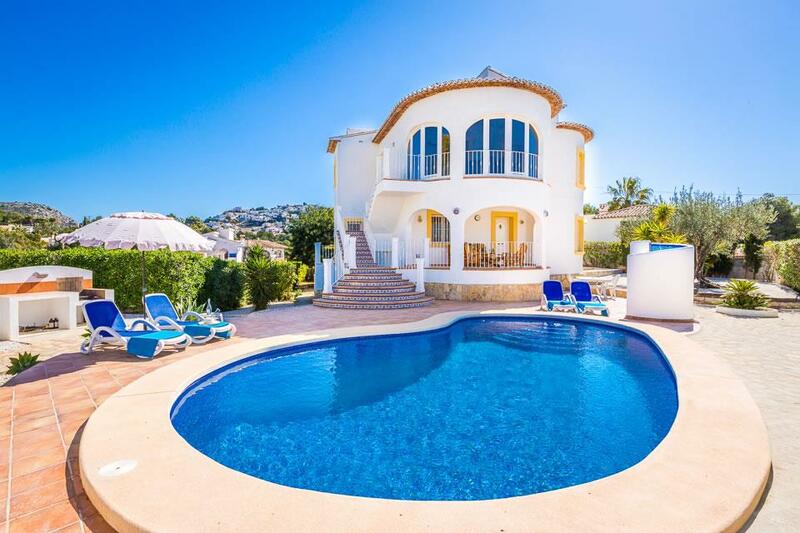 This recently renovated villa is ideally situated just 1.2km (less than 15 minutes walk) from the beaches and centre of Moraira village and also benefits from the availability of a heated pool, WiFi internet, air conditioning, a pool table and UK satellite television. A great retreat with lovely valley views. Beautiful pool area. Outside the property is a private carport. Steps lead up to the lower self-contained apartment. Here there is a private terrace with table and chairs offering lovely valley views. The recently refurbished apartment offers a small lounge / diner with comfortable corner sofa, dining suite,. LCD TV / DVD player and a small but fully equipped kitchen. 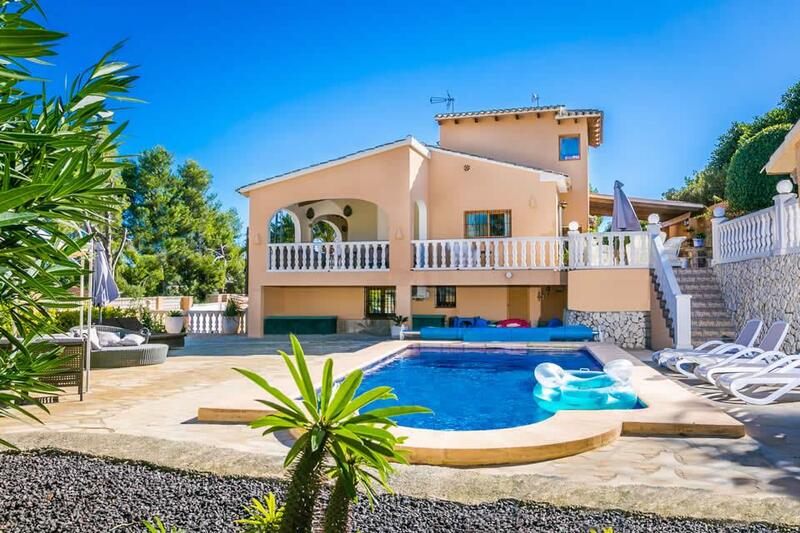 This apartment is ideal for teenagers or grandparents travelling with the party or a second family. There are two bedrooms,one twin and one double both with air conditioning. one bedroom has an en-suite shower room and the other with use of a second bathroom. Exterior steps lead up to the main house and to the pool area. Here, additional to the main pool terrace there are small private outdoor terraces with tables and chairs. Entry to the main floor leads into the fully fitted kitchen / diner, which is very well equipped. The lounge is spacious with brand new corner sofa and high quality fixtures and furnishings. It benefits from beautiful views and satellite TV with a good selection of English channels and a DVD player. On this level there are two double bedrooms, and one twin bedroom all with air conditioining and two bathrooms. The twin bedroom includes a TV & PlayStation 2. The master bedroom is particularly large and well furnished and is ideal for adults wishing to add additional beds or cots for children or babies. Outside, the newly completed designer private pool is surrounded by brand new spacious terraces and features ample high quality outdoor lounge, dining and sun bathing furniture and a pool table! 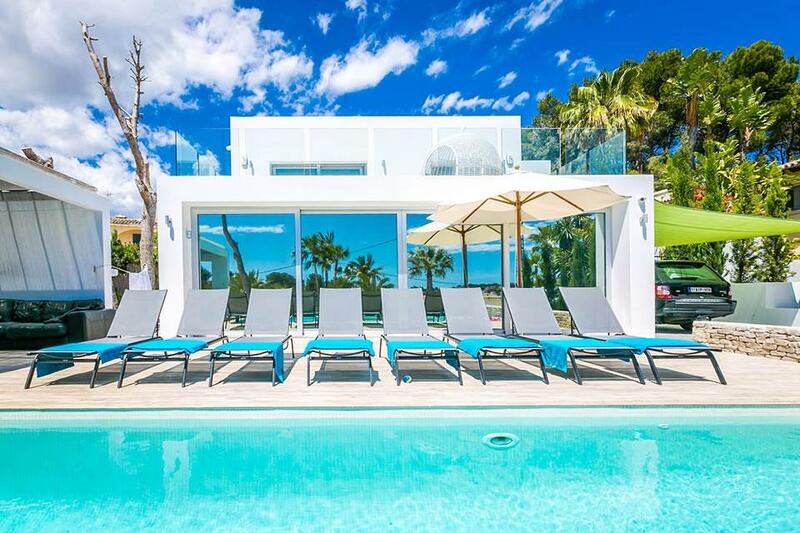 These recent additions and renovations have added a feel of luxury around the pool. 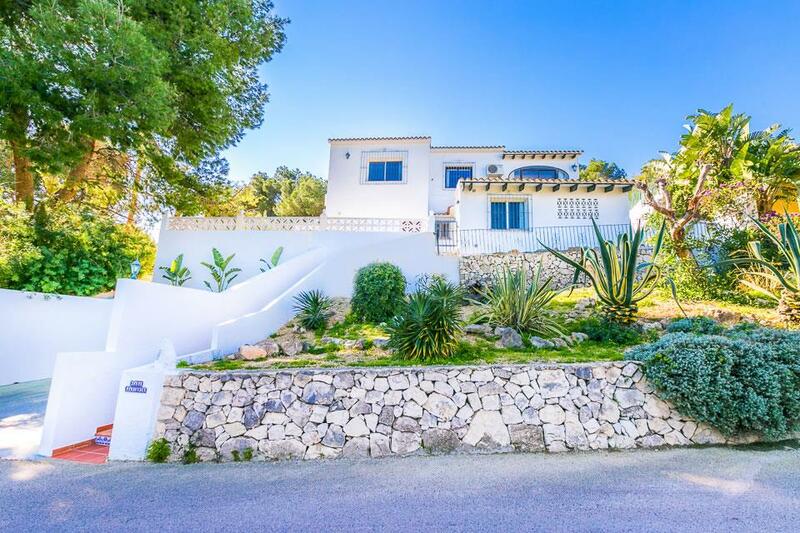 The property is located on Cami De L'estret very close to Moraira in easy walking distance of the village centre and golden sandy beaches. Due to the number of steps up to the main level villa Javiento may not be suitable for the very elderly or infirm. Heated pool facility available at extra cost on request. We had a lovely holiday. 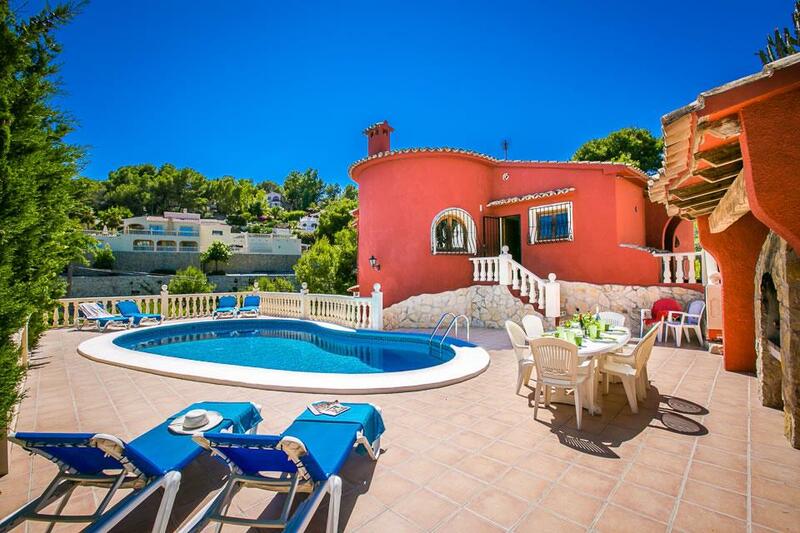 It was our third visit to Moraira and we are definitely planning to return again. The pool was lovely, and location great for wandering into town. We would definitely book with DVH again. 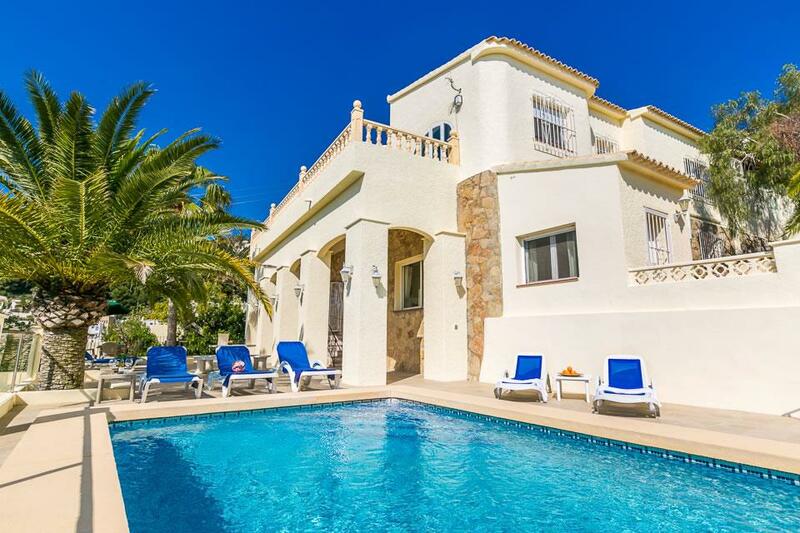 A beautiful five bedroom property with absolutely breathtaking sea views. Fully air conditioned.